Why Are Environmentalists Ignoring The Damage Caused By Factory Farms? I am one of the co-producers of "Cowspiracy: The Sustainability Secret" and making this film was a crazy rollercoaster journey! Navigating through a maze of so many emotions and awakenings depending on where we were, what we were finding out, or perhaps mostly, who we were talking to. Speaking with the hilarious, yet still deadly serious Dr. Klaper was no exception. I can tell you we were not ready for that one, but thank goodness he was. It was so refreshing to hear straight-up and truthful answers from him as we neared the end of filming, after speaking to so many environmental NGO "experts" who gave us Dr. Seuss answers to basic sustainability questions- responses ranging from silence, to avoiding the question, to genuinely having no clue what the answer was. 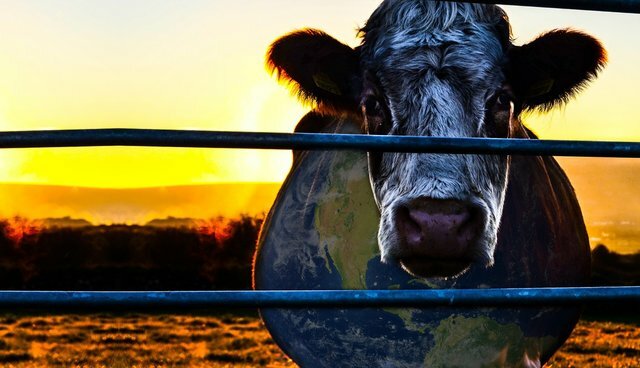 When I said in the film that it felt like I was in a "Cowspiracy Twilight Zone" I was not exaggerating. All the NGO interviews in the film would've been even funnier if it weren't such a serious topic and it wasn't so disturbing to think about what is going on with many of these non-profits. We coined the term "profits over planet" for the feeling we have for what many of these environmental NGO's prioritize. It feels like perhaps they care more about their own sustainability than that of the planet. To not address animal agriculture properly as one of (if not the) leading cause of nearly every major environmental form of destruction and degradation going on today is simply unacceptable. Imagine if the American Lung Association would not talk about cigarette smoking in any of their campaigns and it was nowhere to be seen on their website. And, to top it off, at their office lunches and fundraising dinners, they were passing out packs of cigarettes to smoke. This is akin to what is happening with these non-profit organizations. What makes this even more sad (and suspicious) is that we were not even asking them to tell people to stop consuming animal products, all we ask of them is to inform people about the environmental impact of animal agriculture by (for starters) putting the information on what raising animals for food is doing to our planet on their websites - that's it! Their defense was that they "don't like to dictate people's behavior." Really!?! Posting information is not dictating anyone's behavior, it is simply informing them so they can make their own decision on what to do now that they finally have all the facts. What is even more bizarre about their refusal is this costs virtually nothing for them to implement. At one time during filming, I actually offered to pay 100 percent of Sierra Club's web designer bills to put up an informational "Beyond Meat" page to go alongside their "Beyond Coal," "Beyond Oil," and all the other Beyond campaign pages. Rather than accepting, I was told "no thank you" (at least they were kind about the denial). This is just one example of many where my co-producer Keegan and I pretty much lost it during an interview. I could go on, but someday we will release longer cuts of the interviews, because the more you see them, the funnier (or more bizarre ... or sadder) they are. And then we interviewed the wonderful Dr. Klaper, and what a welcome relief he was to the story. He, along with so many other brave mavericks we interviewed in the film, was not only willing to tell the truth, but excited to tell it. In his own perfect Dr. Klaper-kind of way. We certainly interviewed some "environmentalists" with big growing noses, but look in the mirror; do you have big ears and a long tail? Well if you don't, then you definitely want to watch this film.